Show your family's die-hard love for their beloved D-Backs with personalized Arizona Diamondbacks wall decor from PersonalizedThings by Exposures. This high-quality, MDF vinyl-wrapped frame celebrates your two cherished passions: your family and baseball. Our made-to-order wall art features the Arizona Diamondbacks team's brilliant colors and vintage-style script. It arrives ready to hang with an included sawtooth hanger, complete for quick and easy decorating. 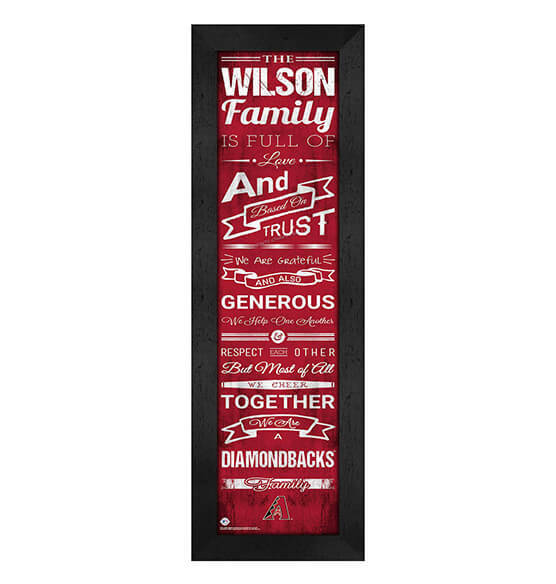 This personalized Family Cheer Arizona Diamondbacks wall decor makes a perfect birthday gift, holiday gift or a just-because gift for the D-Backs fans in your life.